Depending on the chosen location and type of door(s) - which are mostly of pre-hung designs nowadays - installing a new door on new wall is cheapest. Followed by replacing an already existing door. When a door must be placed on a closed wall surface is most expensive because of the internal wall that must be modified with framing as a mount for the newly chosen door. While steel-framed doors can be hung by non-carpenters, they usually fall under the purview of the professional carpenter. Wood framed doors can simply be put up more readily. Although lot can be done with a packet of shims (about $1.60 per door) and a box or two of finish nails (roughly $3.50 per ea. 1 lb box) the setup of shooting brads and nails with a nailer gun (finish nails & brads being sold in larger packs) will vastly outperform the hammer and nail set. Mouldings/Trim & Millwork - amounts spent on casing the door out will naturally depend on the surrounding trim that is receiving a match. But the door casing itself will vary in the vicinity of $.60 Lin. Ft. all the way to over $2.00 Lin Ft.. Times two for both sides of the door. Sold in 8 ft. 10 ft. and 12 ft. sticks depending on the profile and type of wood that happens to be selected from current inventory. 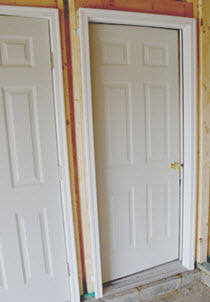 Do It Yourself Door Hanging - about the most popular door project, six panel prehung masonite doors, so economical they are, can be installed for as little as $75 per door, including casing & supplies. Their individual door slabs can sometimes be popped on and off easily for half this amount, assuming hinge and latch placements match up. Other hollow core flush doors are similarly priced or below. Options for solid core interior doors are more toward $120 to $200 ready to hang. Installation by Carpenters - fees for door hanging will average an approximate $150 to $175 per door including basic hardware. But the total charge will take into account the number of doors and their type (hollow core interior being the least expensive, followed by solid core, and then metal exterior doors or those with side panels, costing in excess of $250 to $300). Door Hardware - normally the last item to be asfixed to the door and jamb, hardware on the low side is anywhere from a bottom of the line, $9 single piece, non-keyed passage knob, with prices rising by quality and finish from there. Bolt locks extra. Solid slab doors that don't come with a bore will have to be drilled out by a carpenter who will integrate the price of maybe an extra $35 to $50 into the bill. Efforts at framing and/or wall modification will be additional. Adding headers must be done where required and this may be quoted at an hourly rate. Disposal of the pulled door(s) may come at a surcharge. Some natural doors come prefinished, while others require staining & varnishing. Primed doors will need painting. Performed seperately. Pricier doors that are arriving via a "door shop" often account for the install within the quote. While buying from a single source and not mixing different types of doors can sometimes save on the bottom-line sum.